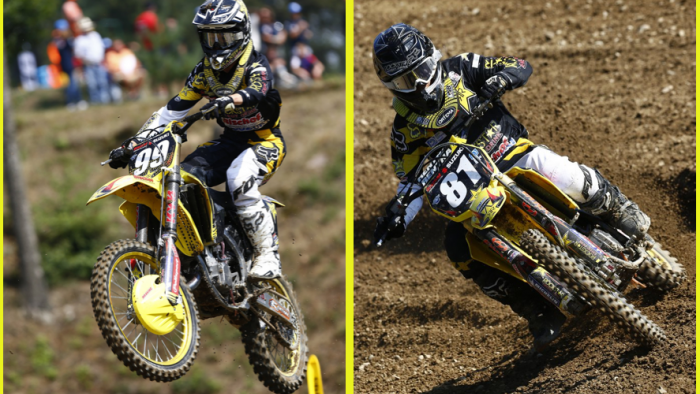 The nucleus of Rockstar Energy Suzuki Europe remained in the Czech Republic this week as three of its riders starred at the FIM Junior World Championships at Jinin. One week after the Grand Prix at Loket the team again tackled Czech soil and saw Jorge Zaragoza and Brian Hsu facing the 125cc class and Gianluca Facchetti in action on the RM85. While Max Anstie headed back to the UK and Jeremy Seewer picked-up a superb second position overall at Ried for the fifth round of the ADAC MX Masters (German Championship) on his RM-Z250 against bigger 450cc machines, it was the young element of the German crew that took centre stage. More than 200 riders from countries across the world flocked to Jinin. Zaragoza was back on his RM125 after campaigning his RM-Z250 in the European EMX2 Championship this year but smelt a chance of success, overdue in the wake of bad luck with injuries in the past 12months. The young Spaniard had to pick up the bike from two small mistakes in the first moto but was still able to place fourth. In the second another error and a bad start gave him a lot of work to do and seventh place by the chequered flag meant that he missed the overall podium by just two points. He classified fourth on the day and now jumps back on the four-stroke for the remaining rounds of the Euro series that runs alongside Grand Prix. On the same bike Brian Hsu could count on a very decent result of fifth - just four seconds behind Zaragoza - in the first moto but rear brake trouble ruined his second race. The sixteen year old was unable to hit any of the bigger jumps and had to concede ground to eventually finish 16th, for 10th overall. Italian national champion Facchetti grabbed ninth and seventh in the two 85cc sprints for a placing of seventh overall in his first crack at the high profile event. The youngster tussled with Spanish factory star Jorge Prado and gave a good account of his talent and desire to succeed. "It was not a bad day and the performances were pretty good," said Team Manager Thomas Ramsbacher. "Jorge has had hardly any race time on the RM125 but we wanted him to attempt this class because we felt he had a good chance of winning. He made some mistakes but gave his best and that's all we can ask. I was pleased for Brian. The first moto was good and with this being his first year on the 125 it was the kind of position I thought he should be. A real shame the brake problem caused him to fall back in the second Heat. Gianluca did well and continues to progress, which is what we are looking for." Rockstar Energy Suzuki Europe continues on the road to Bastogne this week and the Grand Prix of Belgium for round 15 of 17 in the FIM Motocross World Championship.